Biofertilizer technology has shown enhanced plant growth in a number of different plants and different soil conditions. Different microbial species can increase plant phosphorus uptake, fix nitrogen, produce auxins (plant growth hormones) and increase availability of other mineral nutrients. Here’s a good definition from Advances in Applied Microbiology. Biofertilizers are defined as substances containing living microbes, which when applied to seed, plant, or soil promote growth by the supply of essential nutrients such as N, P, and other mineral nutrients. I would add that Biofertilizers enhance plant growth by producing auxins and siderosphores. Biofertilizers can help reduce the amount of phosphorus that needs to be applied to crops. Certain species of biofertilizers sometimes called Phosphate Solubilizing Microorgainsms (PSM), such as Bacillus subtilis, and Trichoderma, can solubilize phosphate making the phosphate available to the plant. By increasing Phosphate uptake, plant yield can be increased. microorganisms convert atmospheric nitrogen (N2) into ammonia (NH3). Ammonia is easily utilized by plants. Nitrogen fixation can be performed only by certain types of microorganisms including Rhizobium and Paenibacillus. The use of nitrogen fixation biofertilizers has become common in soybean and peanut production. Typically, the biofertilizer is applied as a seed treatment. Plant Growth Promoting Rhizobacteria (PGPR) are a type of biofertilizer. This type of biofertilizer first became known around 1970, but just in the last few years have they become more popular. 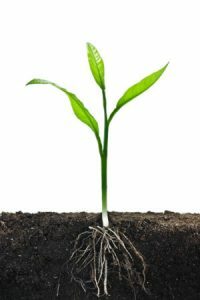 Rhizobacteria (Rhizo means root zone) are bacteria that have formed a symbiotic, or mutually beneficial relationship, with plant roots. The bacteria are attracted by the plant exudates, chemicals that the plant roots give off. In turn, the bacteria produce a number of chemicals that help the plant. Specifically, these chemicals help the plant grow bigger and better root systems. With a better developed root system, the plant is healthier and will produce better yields. Rhizobacteria are known to produce a number of growth hormones such as auxins and gibberellins. These compounds are particularly useful when they are available at the beginning of root formation.